My Wednesday morning class is only every other week so that makes it a little less hectic too. You can see I have those 2 really long days that will be a little stressful. I like my two short days though! Look, I can hit the gym in the evenings with Rob! Of course, most of that white area is homework time or other school stuff. A lot of it is taken up walking between buildings too so that is a bit of a time waster but nothing I can do about that. 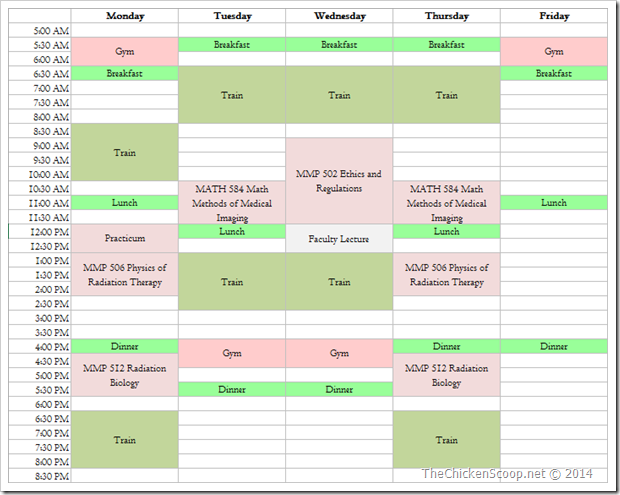 I am happy with this schedule and my classes so let’s hope this semester goes a little smoother than the last! Time wasters like inefficiency, going online too much, getting distracted. Lots of unavoidable commuting time including walking, driving, and taking the train. Making sure I pack enough food to get me through the day. Having energy to hit the gym after my short days. Having energy to get up at 5 to hit the gym on my late days (or go on the weekends). Avoiding stress eating or eating crappy foods because I waited too long (and didn’t pack enough – see above). Staying hydrated (I forget to drink water often). That is just a few. There are always other things like homework taking priority over… everything. Studying, reading, spending time with Rob, etc. It is all a balancing act but the point is to know what you challenges will be so you are prepared to deal with them. I am SO READY for this semester, you have no idea! I think its because I have a math class (did I just geek out on you guys? Yeah, I think so). Okay now I have to be off to get me some coffee and maybe send out a few emails before class! Have a great day! Anytime you want to add a park walk, I am in!! Friday after school or any weekend!! Good luck with this semester! That is annoying! I guess not enough people go on Sundays? I definitely exercise better in the afternoon. Even though I feel tired, I actually get a better work out in the end! Girl what a schedule! I am still trying to find a good balance, but I’ve given up morning workouts. It doesn’t work for me.. I was just thinking that I could get out of the 5AM Monday workout if I exercise on the weekends instead. Then Monday and Thursday would be rest days and I could go later in the morning on Fridays if I wanted to. It is just *so* early!! !